Most of what masquerades as listening and communication is not. It is often an attempt to try to be right, to defend one’s own position, or to develop an appropriate response. The mode of listening is not so much about understanding the other person’s point of view, or getting a deeper understanding of their inner world, as it is about how I can persuade someone to agree with my position. Often we are looking at the other person when our mind is far away, thinking about something else we want to do. This I call “empty listening”. Political discourse is one main example of this dysfunctional communication process. Another is, unfortunately, listening in marriage, with co-workers, friends, or parents to children. This type of listening is an attempt to make one’s own point, not to understand that of another. But, listening shouldn’t be to win an argument or to one up another person as much as to understand a different point of view than the one you hold. Most of what passes for listening is really a form of arrogance and narcissism. It is really about you and not the other person. You want to make a point and win the argument, or persuade another to your point of view. Since life is inter-subjective, then each of us is going to be biased and unique in our own distortions and perceptions of things. When it is your unique subjectivity, interacting with another’s unique subjectivity, how can it be otherwise? The objective of listening is to understand another’s subjectivity in a non-defensive way. Unfortunately, defenses too often get in the way of this. Perhaps this is due to being emotionally triggered by what the other person is saying, and wanting to defend oneself so as not to be too vulnerable. This then leads away from intimacy with others. We all seem to be guilty of this defensiveness. It leads to various problems in marriages, with parents and children, and friends. I have known of long term friendships that dissolved due to this defensiveness. Sometimes it is our very defenses, developed in childhood for our own protection, which gets in the way later in life, and impedes authentic connecting to others. Listening, with the Heart, is more like what is referred to as Contingent Communication. In contingent communication one tries to feel what another is trying to convey and empathize with it. Different from just reflecting what is heard, one tries to empathically “get” what you are trying to communicate about your inner world as you experience it. You might say it is an attempt to understand another’s sense of “being in the world”. This then leads to non- defensive listening and communication, since you are not trying to win an argument, change the other person, be right, manipulate or control. You are just trying to understand another in a non- judgmental way. I hope we can all move toward this form of communication and grow as persons from the process! Jeff Lance PhD. 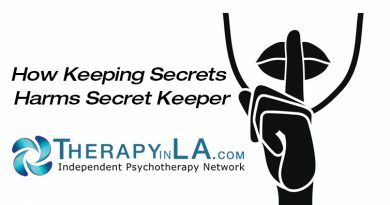 is a psychotherapist in practice in Los Angeles. He is a member of the Independent Psychotherapy Network.